For a long time, one of my favourite blog posts to write was our monthly summary. I genuinely enjoyed reflecting on our month, what we have been doing and what we plan to do next. But no one cared. And that’s tough when you spend so long on blogs and realise that no one actually cares about who your are and what your life is like. They care about the tips you share and the stories you tell but never actually about you. I think it has taken me a little while to realise this but I did miss these monthly summaries. I wanted to share our life with our readers but at the end of the day, our life just isn’t that interesting. Or at least, it doesn’t sound that interesting when compared to the amazing other travel bloggers out their who travel and explore a new place every day. But I miss our monthly summary. So I thought I would do a compromise. That means, the monthly summaries are back but with an overhaul. I enjoy writing these and I enjoy sharing our actual life so that’s what I want to do. I will be focusing on different elements of our life each month, sharing a genuine, honest conversation about our life and how we feel about how we have chosen to live it. Note, I say conversation. I want to know your thoughts, I want to know who you are and why you are reading this. So good or bad, share with us what you think, ask those scary questions and let us get to know you too. That brings me on to this months discussion. It’s weird. At Christmas, I went home to see family and friends and everyone asked “how is China? !” I had no clue how to summarise our life here. Cold. Strange. Different. Fun. Hard. Easy. Convenient. Stressful. Adventurous. Creative. Unusual. Exciting. Frustrating. Hot. Problematic. Annoying. Amazing. Not a day goes by when I done say “oh China”. Sometimes with a sigh, sometimes with a chuckle, sometimes with a smile, sometimes with anger. I don’t think I had quite anticipated how different life in China would be. We love our weekends. We love jumping on a speed train for 30 minutes to Beijing or going for an evening stroll and watching singers and people dancing on the pavements. We love the smiles we get and the villagers who are visiting our city, who go into a frantic photo session with us on the street. We love living in a city and all the perks that come with city life. We love ordering food and having something completely unexpected arriving. It’s different, it’s not your typical day in the South of England. But with every high comes a low. On Friday, I arrived at work to find out our electricity had gone off. In China they have a top up system and we had forgotten to check it. But when I managed to top it up online (because china is convenient like that), it still didn’t turn on! We had to contact our housing agency who contacted the apartment building who had to send a worker up and check our electric box. It wasn’t until 3pm that it actually worked. So, that meant we had one whole day for Calum not being able to work (he works from home). At the start of the month, we went to see Calum’s favourite DJ Tiesto. It was so much fun and drinks were a quarter of the price of Las Vegas too! But when we got back to our hotel, it was boiling. The hotel refused to put on air con until June so we spent the night sweating it out in our room. And this was a more expensive hotel in the area too! The following day, we were exciting to explore more of Beijing. We went for a walk and we couldn’t breath. The AQI (air quality index) was hitting 400 and we literally couldn’t breath. We could taste it. To give you a point of reference, London’s average Aqi is around 50, New York City has an average AQI of 70-90. We wanted to explore the Temple of Heaven and a street food market. That wasn’t going to happen. Because we aren’t use to pollution levels like this, by midday we had thumping headaches and had to head back to our oven of a hotel. This was not the dream expat life we had imagined. We went home to Tianjin and finally made the decision to buy an air purifier for our apartment. Carrefour deliver! Yes, after living here for 9 months, I have finally worked out the carrefour app and literally just had my first food delivery from them whilst writing this post. You can get pretty much anything you want delivered to your door. Not just from carrefour but from restaurants, clothing stores, Starbucks, jam (!!) etc etc. So yeah, China is convenient when you are in your apartment. When the weather hits minus ten, which it does in the winter, it is easy. You can live incredibly comfortably. When you step out of your apartment, there can be struggles, like everywhere I guess. We use Didi to get around – an app like Uber but even easier to use and definitely cheaper. Couple that with a metro system that is fairly simple to navigate yourself around with air conditioned and clean trains, getting around Tianjin couldn’t be easier. My biggest struggle personally is the language. It makes me wish I had seriously spent time before moving, trying to learn Mandarin. And I know some, very basic words, that help me get around but I really should learn more. Tianjin is a second tier city in China, so there are very few expats around here and very few Chinese locals speak English. We have become experts at pointing at things or using our best attempts at sign language and gestures to communicate. One weekly struggle we face is the phone calls. When you order food, shopping or anything (and everything in my case) from TaoBao (If eBay met Amazon and had a baby, in China, this would be it), the delivery drivers tend to call your mobile to verify where you live. It is so frustrating to answer and just giggle nervously, trying to explain that you don’t understand. These are some of the prominent ups and downs we have experienced in China. So I never forget any of them, we are going to share them on our Instagram story! Head over to our Instagram page to see what our life in China is like – we will be updating it every day with our struggles but also our highs! Let me know your thoughts! If you have any questions about living in China, drop them below! That’s it for my reflection time, now for some stats. You may notice these have also been revamped! Since our last monthly summary, I can officially say our blog is earning money each month. This is predominately from sponsored posts and amazon affiliates >> feel free to use our amazon link if you wish to support us. We make a small commission on anything you buy within 30 days and it doesn’t cost you anything extra. Our big focus at the moment is on our session numbers. This is slowly building and we are now getting around a steady 18,000 sessions a month. We are aiming to reach 25,000 in order to apply to Mediavine, following some advise from Lia; an awesome and inspiring travel blogger – make sure to check her blog out over at Practical Wanderlust. How have we doubled our numbers in just under 2 months? We signed up to Tailwind to boost our reach on Pinterest, I added pins to our destination page as these were just sitting there getting very little traffic for a long time and we posted more frequently. In fact, this month we tried a 30 day challenge with some other travel bloggers, posting a brand new blog every day of this month. It gave our website a massive push and meant I could catch up on a lot of content I had been meaning to write for ages. Plus, we started posting more regularly over on CTG TV – our Youtube travel where we share videos of daily life here in China but also vlogs from our travels. Our Thailand videos have been fairly popular so we have seen some traffic from this regular schedule. Because we have been super busy juggling all of these things above, we have had hardly any time to work on our social media accounts. I am sharing content across our social media pages every day but there has been a very steady, slow growth in numbers. I have decided for now that the reason we started a travel blog was to write, not to worry about how many people liked my latest Instagram photo. So the writing is what I am going to focus on. Next month, I am going to slow down with the writing and focus on publish 2-3 posts a week of longer, detailed itineraries and guides to some of our favourite destinations. Now we are back in China, we will be focusing on producing more Living in China videos so shoot us any questions you have about living in China and we will answer them in our next Q & A. Previously in this section, I listed some blog posts that I loved but was always too nervous to be negative about what I disliked that month. Yeah, let’s change that. This month, i have had a lot of love for the children I teach. I think it has just got to that time of the year where we have such a strong rapport and relationship and I can really see the progress they have made so far, it is just an awesome experience. This is why I became a teacher. Another thing I have a lot of love for this month – Lia over at Practical Wanderlust! Now I may thoroughly seem like a stalker, but this girls monthly income reports are incredibly inspirational for bloggers wanting to push their blog to the next level. These are some of the only income reports I have read that are completely transparent with how she makes money and what apps and tools she uses. The Purge – an odd one yes, but everyone was banging on about how awesome these movies were and I finally watched them. Like all of them. In the space of one evening. Home sickness – This month has been tough with the home sickness. A few things back home have made us want to fly back and be with our family so it has been incredibly tough not being around for various events or situations. We knew this would always be the case when we decided to move abroad but it doesn’t make it any easier. Lack of weight loss – I had this big plan that when we moved to China, I would eat super healthy and exercise everyday and lose so much weight. Yeeeeah it has been 10 months and I have put on weight! I didn’t anticipate that all western food was predominantly unhealthy, healthy food was incredibly expensive and hard to find and that the swimming pool in our apartment is constantly freezing. This will change! I will keep you updated with this one next month! Starting the month off watching Tiesto! I have no idea why this photo is are most liked Instagram post – it is a photo of the Italian Quarter in Tianjin. May promises to be a fun month. We will be heading to see the singer Jake Bugg on Friday over in Beijing and we are hoping to explore some more of Tianjin and Beijing throughout the month. I hope you enjoyed reading our new monthly summary – what do you think of the new layout! Let us know in the comments below! Any questions about what it is like living in China? Drop the questions below too! Hello! Always wondered what it is like living in a secondary city in China! 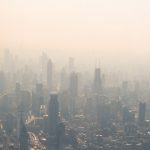 We have been toying with idea of trying life as an expat in China, but I don’t know ‍♀️ – am mostly worried about the pollution, quality of life for the kids… what you think?? Hi Julz, I would always recommend giving life in China a go. If you have a job where you can move to China for a few years, try it. We have many teachers are my school with young children and they are happy, they have a lot of things to do for children in China because children are everything! The pollution is tough but you get some very very nice days especially in the summer. We use face masks too and have an air purifier. We much prefer Tianjin to places like Beijing and Shanghai – these cities the pollution is worse and it is too touristy to get a real insight into China life. I hadn’t read the previous version, but this is fascinating. Such a great insight into the expat lifestlye, and how you are juggling everything. I’d heard about the pollution issues, but the numbers give real context to the scale, as does your comment about needing to return inside. Thank you Bernie, I am happy to hear you like this post! Yeah the pollution is the one thing that holds us back from staying long term! This is such an interesting post. I think I would like to experience living in China but the pollution puts me off! I might give it a try out of the big cities! Hi Katie! I loved your blog – it is very realistic and gives real insight to a day-to-day life in China. I have a question with regards to teaching in China – do one need a degree to be a TEFL teacher in China? I have read that you do need one and then also that you do not need one, only thing is that your salary would be less – how true is this? I believe if you wish to teach for a some time and therefore want a longer visa, then you do need a degree. You never use to but the visa requirements have changed in recent years. If you don’t have one, depending where you are from, you can still come and teach for shorter durations though. Where are you from? It all depends on your passport to be honest. So grateful for this post that I came across through Pinterest! Ill be living in Tianjin for 7 months and will definitely be exploring more of your blog! Thanks for being so real and sharing part of your story! I hope I learn more about you and your experiences in my exploring! That is great, welcome! Check out our youtube channel to see more videos about Tianjin 🙂 We have lived here for nearly two years now and it is definitely very different to the UK, I will be sharing more posts on tips for living and travelling in China soon.